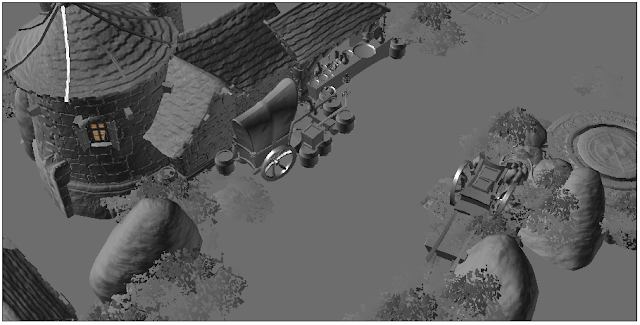 This is work in progress and I will spend more time with optimizations before moving on to the next demo. You'll notice that there's still frame-rate-stuttering when moving around the map (with left-mouse-button + dragging). The bad type of stuttering is caused by asset loading which happens on demand when new graphics objects are pulled in as they enter the view volume. I don't know yet what causes the lighter stuttering when moving around in areas which are completed loaded. I need to do a detailed profiling session to figure out what's going on there exactly. The stuttering also happens (to a lesser extend) in the native OSX version of the demo. It's most likely the preparation and creation of OpenGL resources, like vertex buffer, index buffers and textures. I will need to figure out how to move more of the asset creation stuff out of the main thread. The demo is also quite demanding on WebGL. Despite the pseudo-instancing which I implemented recently there's still a lot of OpenGL calls per frame. Support for the OES_vertex_array_object (Chrome already exposes this) and something like ARB_instanced_arrays would help a lot to reduce the number of GL calls drastically (the JS profiler currently shows the vertex array definition as the most expensive rendering-related code, followed by the matrix array uniform updates for the pseudo instancing code). Also, originally I wanted to include SQLite into the demo, since additional map info is currently stored in an additional SQLite file (lighting information, player start position, etc...). But this didn't work out of the box because SQLite's file i/o code must be adopted. This wouldn't be hard to fix, but I actually want to get rid of SQLite for a long time. SQLite was really useful as save-game system in the single player Drakensang games, but if you don't need to save game world changes back, a complete SQL implementation in the client is just overkill. So this is another good reason to finally get started with a nice and small TableData-subsystem in Nebula3. The frame-stuttering is a tiny bit disheartening, but on the other hand this is to be expected when bringing a complex code base over to a new platform. Most important right now is to really know what's going on, so I will probably spend some time adding profiling code and do some performance analysis next - together with text rendering to get some continuous debug statistics output on screen. Very well done! I love this work. BTW. I've seen several Nebula3 in Google Code, which one of them is the TRUE Nebula 3? Some of them had no activity for a very long time.